Introduction to Abstract Algebra presents a breakthrough approach to teaching one of math's most intimidating concepts. Avoiding the pitfalls common in the standard textbooks, Benjamin Fine, Anthony M. Gaglione, and Gerhard Rosenberger set a pace that allows beginner-level students to follow the progression from familiar topics such as rings, numbers, and groups to more difficult concepts. Classroom tested and revised until students achieved consistent, positive results, this textbook is designed to keep students focused as they learn complex topics. Fine, Gaglione, and Rosenberger's clear explanations prevent students from getting lost as they move deeper and deeper into areas such as abelian groups, fields, and Galois theory. This textbook will help bring about the day when abstract algebra no longer creates intense anxiety but instead challenges students to fully grasp the meaning and power of the approach. 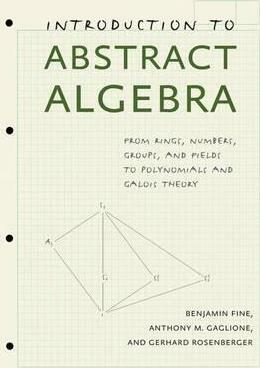 Benjamin Fine is a professor of mathematics at Fairfield University. Anthony M. Gaglione is a professor of mathematics at the United States Naval Academy. Gerhard Rosenberger is a professor of mathematics at the University of Hamburg.